According to the Remodeling 2014 Cost vs. Value Report completing a midrange minor kitchen remodel costs on average, $18,527 and you can recoup 75.4 percent of the remodeling costs during resale. Your go-to source to find your new home. Remodeling your kitchen is a top way to improve your home's interior aesthetic and to increase its resale value. According to the Remodeling 2014 Cost vs. Value Report completing a midrange minor kitchen remodel costs on average, $18,527 and you can recoup 75.4 percent of the remodeling costs during resale. Follow the below dos and don'ts to avoid unnecessary time and monetary investments, and to increase your home's value. 1.) Do your research Before you meet with a contractor or architect, create your own Pinterest or Houzz accounts to curate images of your dream kitchen. Consider your ideal layout, appliances, functionality, finishes and color palette. Prioritize these images by "must haves," "would be nice," and "one day." 2.) Do consider the purpose of the space. Is your kitchen your family's gathering hub? Do you host elaborate dinner parties, and need space to prepare for your guests? Are you a master chef who needs top-of-the-line appliances? These details will help your architect determine the best layout to maximize your kitchen's functionality. Also, consider the activity level of your kitchen. An active family of four brings more wear and tear than empty nesters, so install flooring and finishes that will withstand this level of use. 3.) Don't skip the technical homework. 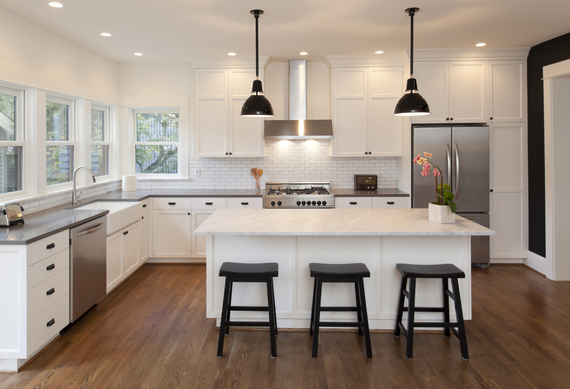 When visualizing your new layout, determine the best location for your sink, where you need electrical outlets and if you are building out, where you need windows or a sliding door. The functionality of these features will dictate the layout of the rest of the room. 4.) Do maximize space. Take advantage of every square inch of your kitchen. If you aren't building an addition, you can still gain space during a renovation by extending cabinets up to the ceiling, or turning an awkward corner space into a food prep corner. 5.) Don't rush through the planning and design phase. Your instincts will be to move quickly to the construction phase, but take your time to visualize the layout, functionality and design of your new kitchen. Every change during the remodeling process will cost you money and time, so picture yourself going through your daily routine in your new kitchen. 6.) Don't price yourself out of the neighborhood. The house may not be yours forever, so avoid adding so many upgrades that you price it out of the neighborhood when it comes time to sell. 7.) Do budget to exceed. Budget at least 10% more in additional expenses to cover unforeseen costs you may likely incur. 8.) Don't overlook the business details. If you are using a contractor, get all the details of the renovation in writing up front, before you sign any contracts. Don't make the final payment until all renovations are complete. 9.) Do keep your receipts. File all receipts associated with your renovation in a safe place to submit when filing your taxes, or to reference if you sell your home. Stay up to date on home buying, remodeling and decorating advice on the HomeFinder.com blog. About: HomeFinder.com is a digital real estate site that offers an easy to navigate home search experience. Whether you are at home or on the go, HomeFinder.com makes it simple to find your new home. Start your home search today.